The numerous and varied materials which represent 17th-century material culture at Ferryland require an on-site conservation laboratory for artifact stabilization and documentation. 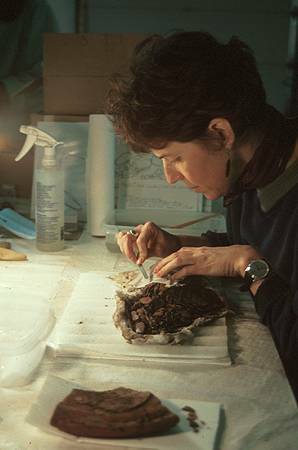 Many artifacts require extensive conservation and stabilization prior to being studied by archaeologists and then exhibited. At the Ferryland laboratory some objects receive complete conservation treatment, while others receive only the initial stages of a long process of conservation. At some point, all artifacts pass through the laboratory for cataloguing and documentation. The laboratory is located on the second floor of the Colony of Avalon Interpretation Centre. At some point, all artifacts pass through the laboratory for cataloguing and documentation. © 1999, Newfoundland and Labrador Heritage Website. Conservation means all the actions taken to preserve cultural property. It includes the treatment or stabilization of material culture and also its documentation (both written and pictorial). Often (as is the case for the Ferryland site) non-conservators assist with routine tasks. Such persons have the practical knowledge of conservation without the formal training. The laboratory is equipped with a supply of water, fume extraction for solvents, chemical storage cabinet, a freeze drier for the conservation of organic materials, microscopes and lots of natural light. 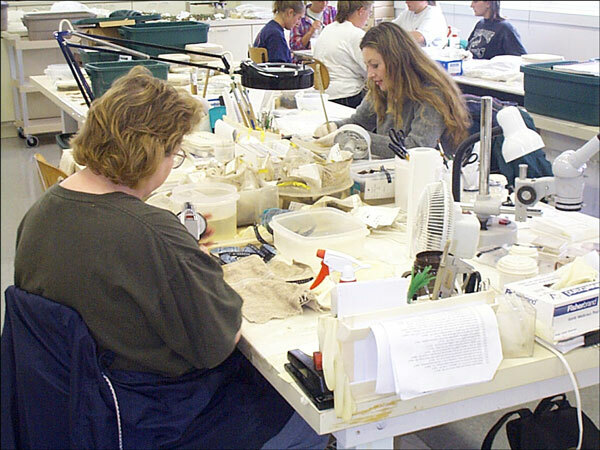 The space is divided into four working stations, which include cataloguing, iron and ceramic documentation, conservation stabilization and treatment, and a wet area for the aqueous cleaning of artifacts. Mechanical cleaning is the first step in the conservation of an artifact. The artifact assemblage includes both inorganic and organic materials. Inorganic objects are those made from stone, glass, clay and metals. Organic objects are those made from living things, such as wood, wool and leather. Because the 17th-century artifacts have been buried for over 300 years, they change or deteriorate as they react with the soil. In the case of iron objects, the original shape of the object has often been replaced by corrosion, the rust layer that develops during burial. For other objects this process is less extensive. For example, the gold rings found at the site did not appear to have changed at all during burial. Thus it is the responsibility of the conservator and non-conservators to identify, document, catalogue, stabilize, conserve and (in special cases) restore the estimated 3,000 artifacts which are brought to the laboratory each week of excavation.